One-third of the organizations we talk with are still assessing how to get the most from SharePoint and Office 365, including new Microsoft data compliance tools. There is a way to capture and classify emails and files to make data easily accessible and compliant all in one shot. 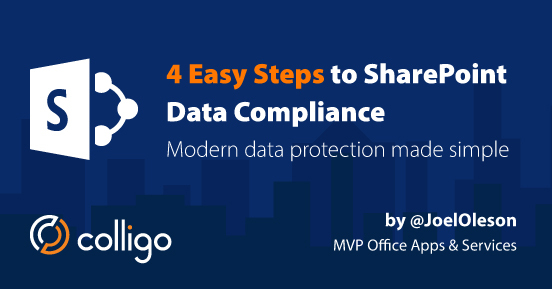 To provide practical insight, Colligo has teamed up with Microsoft MVP/RD and 19-year SharePoint veteran, Joel Oleson, to offer a webinar with simple steps to set up your environment to protect data in a way that’s easy for users and advances the company’s information compliance. SharePoint data compliance made easy: Site classifications, labels and the user experience – 1 hour webinar. How to make it easy for users to save and classify files to SharePoint without leaving Outlook and Office 365. As Joel observes, “many companies are missing the keys to success and may find a lot of value in seeing a sample built out based on prescriptive guidance. SharePoint Online may seem plug and play, and releasing the service as is and letting users get on with their work and sites may seem like the right thing to do.